Card #2 Spaceport and Moon shows Santa with two aliens in a Model T sleigh with a surfboard on back. A sign on the Moon says “Snoopy was Here”! Running away from the reindeer is a little dog in a space helmet. The two aliens are digging up gold. The astronaut on the right has a box of Moon gold, and the astronaut on the left is filming the scene with a TV camera. Perched on his back is a parrot in a space helmet. 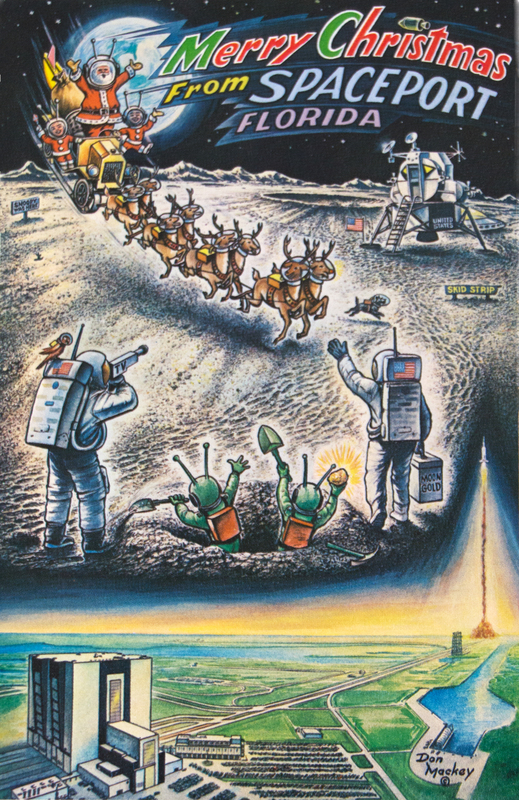 Christmas card from the 1960s and 1970s by NASA space artist Don Mackey. Card purchased on eBay.